Feyzmand*, S., Shahbazi, B., Marami, M., Bahrami, G., Fattahi, A., Shokoohinia, Y. (2017). Mechanistic in vitro evaluation of Prosopis farcta roots as an antidiabetic folk medicinal plant. 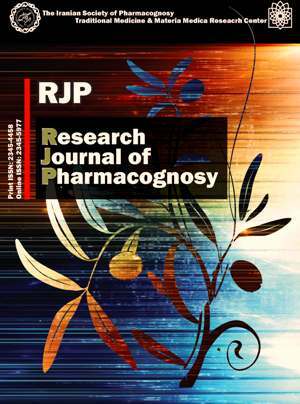 Research Journal of Pharmacognosy, 4(Supplement), 55-55. S. Feyzmand*; B. Shahbazi; M. Marami; Gh. Bahrami; A. Fattahi; Y. Shokoohinia. "Mechanistic in vitro evaluation of Prosopis farcta roots as an antidiabetic folk medicinal plant". Research Journal of Pharmacognosy, 4, Supplement, 2017, 55-55. Feyzmand*, S., Shahbazi, B., Marami, M., Bahrami, G., Fattahi, A., Shokoohinia, Y. (2017). 'Mechanistic in vitro evaluation of Prosopis farcta roots as an antidiabetic folk medicinal plant', Research Journal of Pharmacognosy, 4(Supplement), pp. 55-55. Feyzmand*, S., Shahbazi, B., Marami, M., Bahrami, G., Fattahi, A., Shokoohinia, Y. Mechanistic in vitro evaluation of Prosopis farcta roots as an antidiabetic folk medicinal plant. Research Journal of Pharmacognosy, 2017; 4(Supplement): 55-55. 3Medical Biology Research Center, Kermanshah University of Medical Sciences, Kermanshah, Iran. 4Pharmaceutical Sciences Research Center, School of Pharmacy, Kermanshah University of Medical Sciences, Kermanshah, Iran. Medical Biology Research Center, Kermanshah University of Medical Sciences, Kermanshah, Iran. Background and objectives: Prosopis farcta has been used as a traditional herbal medicine for treating diabetes mellitus.The aim of this study was investigating the antidiabetic mechanisms of infusion extract of P. farcta and discovering the active extract for the first time. Methods: Six different extracts of P. farcta were prepared using five different solvents [ethanol, n-hexane, acetone, ethanol: water (1:1 v/v), and water]. Cytotoxicity and cell proliferation assays were performed on mouse pancreatic β-cells (β-TC3) using the MTT method. The effects of P. farcta on glucose metabolism (in HepG-2 hepatocellular carcinoma cell line) were evaluated. The protective effects of various P. farcta extracts on cytotoxicity, mitochondrial membrane potential (MMP), and streptozotocin-induced apoptosis in β-TC3 cells were investigated. Results: P. farcta did not affect the viability of β-TC3 and HepG-2 cells up to 0.5 mg/ml. Infusion (INF) was the only extract which could protect cells against STZ. The proliferation results showed P. farcta extract did not increase proliferation in β-TC3 cell line compare to control. Conclusion: Only INF attenuated the death and apoptosis induced by STZ in β-TC3 cells. It could exert a significant glucose-lowering effect.